According to a new series of reports by iData Research, the United States video and integrated operating room (OR) market is valued at $2.4 billion USD and is forecast to exceed $3.3 billion by 2024. Integration is becoming more common in the OR environment, as a significant percentage of the ORs in the U.S. have already upgraded. The number of procedures being performed in ORs is also steadily increasing due to improved medical capabilities as well as an aging population. With the changing demographics in the U.S. and budget uncertainty looming over the healthcare sector, there is increasing demand for hybrid rooms. These rooms offer more flexibility, which is beneficial to both physicians and patients, albeit at an increased price. “Hybrid ORs and hybrid OR imaging systems are the two fastest-growing markets in the total video and integrated OR market, making their combined value the second-largest among all the segments in the total market,” says Kamran Zamanian, CEO and President at iData Research. Since hybrid ORs by definition require a fixed imaging system, integration companies, such as Steris, Maquet, Stryker and more, have been partnering with imaging companies, such as Siemens, Philips, GE and Toshiba, to include their equipment in hybrid ORs. Many facilities are taking the next step following the introduction of hybrid ORs towards multimodality imaging room systems. Essentially, three ORs would be built side-by-side, with a general OR in the middle, a hybrid OR on the right and a Magneto-Optical (MO) imaging room on the left. This setup would have the ability to do MO imaging, MRI imaging, as well as angiography imaging and sometimes CT imaging. They would also be able to fuse the imaging through software, creating a full 3D image of the patient’s internal systems including the circulatory system, bone structure and other vasculature and tissue systems. An example of this technology in practice is the Advanced Multimodality Image Guided Operating (AMIGO) suite at the Brigham and Women’s Hospital. The AMIGO suite makes use of an efficient three-room design across 5,700 square feet, offering immediate intra-procedural access to multiple imaging modalities. The suite is primarily being used for image-guided neurosurgery, but has the capacity to facilitate a greater range of minimally invasive procedures. More can be found in a series of reports published by iData Research entitled the U.S. Market Report Suite for Video and Integrated Operating Room Equipment 2018. 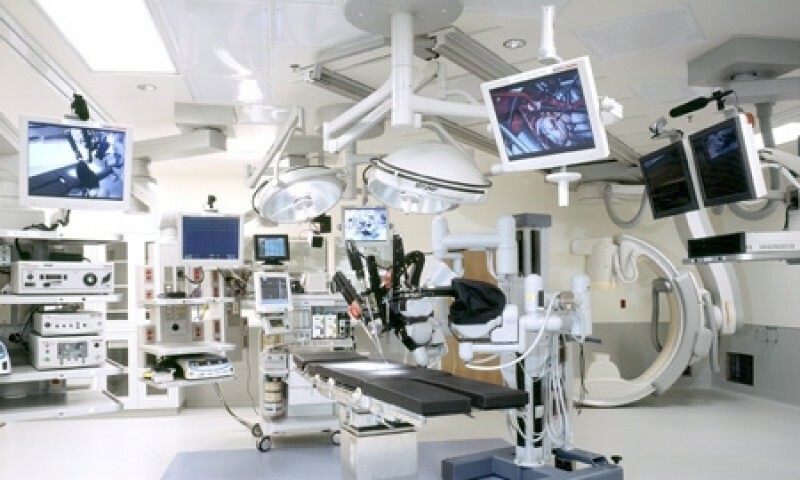 The U.S. market for video and integrated operating room (OR) equipment includes integrated OR components, hybrid OR components and imaging systems, surgical camera systems, digital image capture and recording devices, surgical displays and PACS monitors, medical photo printers, surgical lighting, booms, tables, microscopes, and integrated OR management software. Email us at [email protected] or register online for a U.S. Market Report Suite for Video and Integrated Operating Room Equipment 2018 brochure and synopsis.